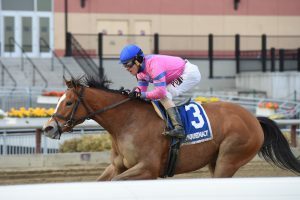 Last seen winning the Bouwerie Stakes by 1 1/4 lengths at Belmont Park last May 25 for her third win in a row, Holiday Disguise owed her extended holiday to an ankle issue. Even so, Holiday Disguise has been ready to race for seven weeks, but in this case her connections had to contend with different circumstances beyond their control. 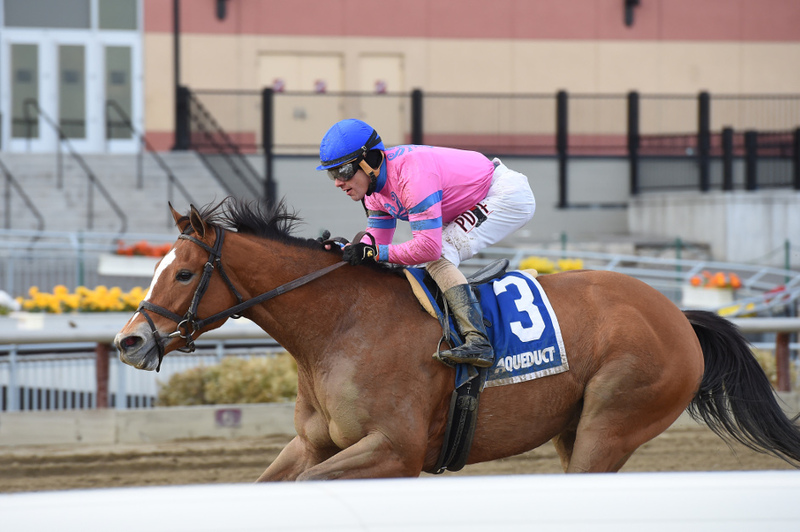 Rice said, “We’ve been trying to get her in a race since December 13, but between the weather and quarantine and cancellations, it’s been tough.” Rice’s barn was quarantined in January when a horse tested positive for EHV-1. Co-favored at odds of 6-5 (1.30) with Frostwise (1.20), Holiday Disguise broke forwardly to go the one-turn mile, but took back under Junior Alvarado and tucked in neatly behind dueling leaders Frost Wise and No Hayne No Gayne for the backstretch run. Cruising comfortably as the top two battled through early fractions of 24.38 and 48.16, Holiday Disguise began to move clear of Decorator directly to her outside and set up as a clear third for the run around the far turn. At the quarter pole Holiday Disguise angled out three-wide, was shaken up by her pilot at the top of the stretch and, when asked for run, complied. Striking the front, she cruised smoothly to a 3 1/4-length victory. Alvarado, who peeked back in the final furlong and saw no menace in sight, geared the 4-year-old down in the final 70 yards. After six furlongs in 1:14.40, the final time over the “good” going was 1:41.06. Frost Wise, second, finished 4 1/2 lengths ahead of No Hayne No Gayne, followed by Literata in fourth, Decorator Jen and Carry Your Heels. Holiday Disguise now has four wins from five starts, two stakes victories and has earned $209,150. Bred by Dr. William B. Wilmot and Dr. Joan M. Taylor, Holiday Disguise is out of Wilmot and Taylor’s Thin Disguise (Yes It’s True), a winning half-sister to millionaire and 2007 New York-bred Horse of the Year Naughty New Yorker. Her second dam is the couple’s late star broodmare Naughty Natisha. 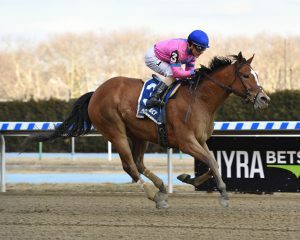 Thin Disguise has produced four winners from four foals to start, among them Midnight Disguise, who recently earned Kentucky Oaks points with a victory in the Busanda Stakes on January 25. The mare has a juvenile colt by Verrazano, a yearling filly by Tiznow and was bred in 2017 to Bodemeister. Holiday Disguise first changed hands as a weanling, purchased by John Greathouse for $70,000 at the Keeneland November sale. Rice bought the talented filly for Sheila Rosenblum’s Lady Sheila Stable as a yearling, going to $220,000 at the 2015 Fasig-Tipton New York-bred preferred sale.